At the killing and burial site today. Photo © 2019 RJH. Today we returned to Rohatyn to mark the 77th anniversary of the destruction of the city’s Jewish community. 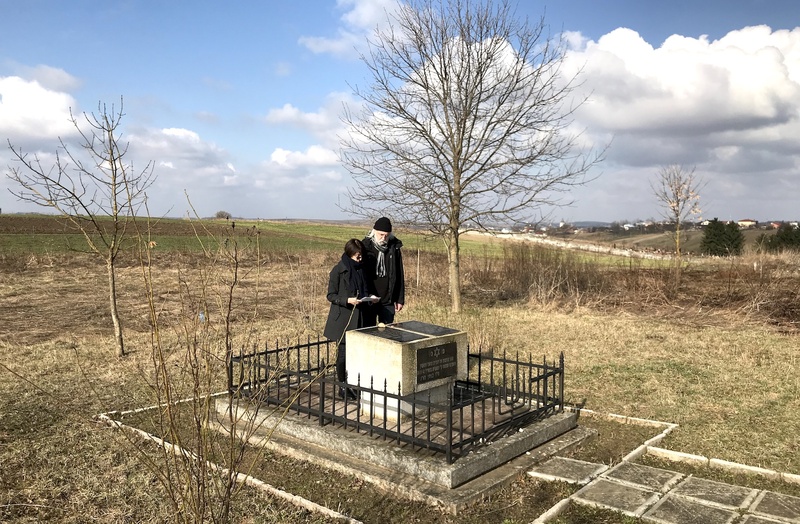 At the 1942 wartime mass grave, south of the city center, we read a prayer – El Malei Rachamim (אֵל מָלֵא רַחֲמִים, “God, full of mercy”) – for the more than three thousand Jewish victims of the first deadly “aktion” of the German occupation of Rohatyn, when most of the Jewish community was forcibly assembled, transported on foot and by truck to previously-dug trenches at this site, and then shot in small groups until all of those gathered were dead. At least a thousand of the victims were children. 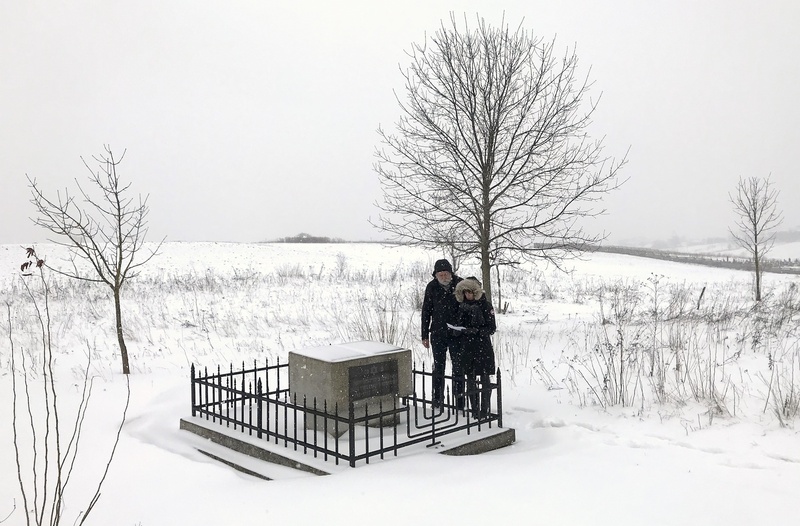 This was the third consecutive year we have traveled to Rohatyn to commemorate and reflect at the site on the anniversary date. On the significant 75th anniversary in 2017, we were led in prayer by Rabbi Kolesnik and joined by Ukrainian and American friends and colleagues from Rohatyn, the region, and abroad. Last year and this year we solemnized the date with our Lviv friend, driver, and interpreter Vasyl Yuzyshyn. The commemoration last year. Photo © 2018 RJH. At nearly eight decades’ remove from the horrific events, and without eyewitness testimony of the killing at the site, it is impossible to comprehend the catastrophe which happened here except in numbers. We (and history) are fortunate to have the memoir of Jack “Kuba” Glotzer, a teenager living with his family in the Rohatyn ghetto at the time of the aktion, who survived the round-up in hiding and then was forced during the following days to untangle frozen corpses at the killing site, and to fill and close the trenches. We must work hard to commemorate the centuries-long full life of the Jewish community of Rohatyn, and not only its end. We invite everyone to read our introduction to the history of Rohatyn’s Jewish community, from early years to the Holocaust and on to the lively international émigré descendant and survivor families of today.